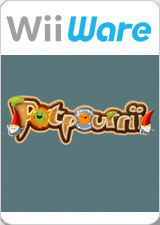 Potpourrii is played similar to the games Puzz Loop and Puzzle Bobble. The plot of the game revolves around a group of gnomes repairing their magical forest after a chaotic rampage by an evil warlock frees all the forest spirits. The object of the game is for the player to contain these spirits by matching three or more spirits of the same type in order to make them disappear. The graph below charts the compatibility with Potpourrii since Dolphin's 2.0 release, listing revisions only where a compatibility change occurred.